We’ve already discussed how the shoulder has to move a lot and remain stable (click here – to find out more about shoulder range and shoulder dislocation). When this balance is out of kilter we tend to get an impingement syndrome. Essentially the tendons of the dynamic stabiliser muscles of the shoulder, known collectively as the rotator cuff, rub against and get pinched between the bony and connective tissues of the shoulder joint. This rubbing and pinching sets in train an inflammatory process resulting in pain and restricted movement. Very occasionally an impingement syndrome can occur as the result of a traumatic injury, but it usually presents in response to repetitive overhead arm movements. Now lots of people perform repetitive overhead movements at work or sport and never develop impingement symptoms, so what puts some at risk and not others? It would seem that some people have genetically “smaller” spaces within the shoulder predisposing the rotator cuff tendons to irritation – note to self: pick better parents next time. 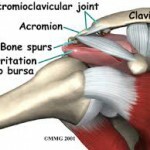 Narrowing of the spaces within the shoulder is also more common as we age due to the growth of osteoarthritic bony spurs. 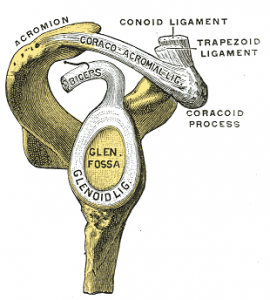 At the other end of the spectrum are the “loose” shouldered folk who’ve had previous dislocations or whose sport or work has caused overstretching of the shoulder connective tissue. Combine this tissue laxity with poor posture and you get a shoulder that doesn’t “sit” as it should thus leading to the movement-related impingement. 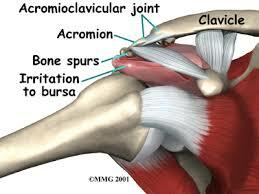 When impingement is the result of a dynamic instability these folk may require surgery to repair the shoulder. Surgery is also used where significant degenerative changes are contributing to the symptoms and in cases where congenitally “narrow” spaces make conservative management unlikely to resolve the condition. Corticosteroid injections are also frequently used to settle bursa and tendon (-sheath) inflammation. In most cases we aim to conservatively manage the painful symptoms and work on regaining range of movement, strength and movement control. In physio-world the way in which the shoulder blade and arm move together is referred to as scapulohumeral rhythm. Restoration of normal rhythm, particularly at the extremes of range, is essential in achieving pain-free movement. Improving posture and increasing range of movement in the joints of the neck, thoracic spine and ribcage plays a big role in managing this condition. Once we get the basics under control it’s time to challenge the patient with higher level sport and work-related tasks such as lifting, pushing and pulling under load and at speed.